Steinway & Sons, also known as Steinway, is a German-American piano company founded in 1853 in Manhattan by German piano builder Heinrich Engelhard Steinweg, later known as Henry E. Steinway. It has two factories, the one you will visit in Queens, New York City, which serves the Americas, and the other in Hamburg, Germany, which serves the rest of the world. Steinway produces 3,400 pianos annually, sold through about 200 authorized dealers operating around 300 showrooms worldwide. Until his death in 2008 at the age of 93, Henry Z. Steinway, the great-grandson of the founder, still worked at the factory and put his signature on custom-made pianos. He was the last member of the Steinway family to be president of the company, from 1955 to 1977. Steinway & Sons’ parent company is Steinway Musical Instruments, which is privately owned and was acquired in 2013 by John Paulson. In 2015 Steinway introduced a digital player piano series called Spirio, which has been very well received by the market. It now accounts for a significant share of new piano sales. Later in 2015, Steinway made its 600,000th piano. The piano features the Fibonacci spiral and Macassar ebony veneer. It took 6,000 hours of work over 4 years to make the piano, which was priced at $2.4 million. In addition to the Steinway & Sons brand, Steinway markets two other brands of pianos, Boston and Essex, made using lower-cost components and labor. Boston pianos are made for the mid-range market by the Kawai piano factory in Hamamatsu, Japan. Essex pianos are made for the entry-range market at the Pearl River piano factory in Guangzhou, China. New pianos of both brands are made with Steinway owned designs and are sold exclusively through Steinway authorized dealers. At the STEINWAY & SONS New York factory, you will see how the world’s finest piano is made and learn why the STEINWAY sound is coveted by artists around the globe. Your in-depth tour will be led by the STEINWAY & SONS Educational Program Manager and conclude with an opportunity to try a selection of new STEINWAY pianos. 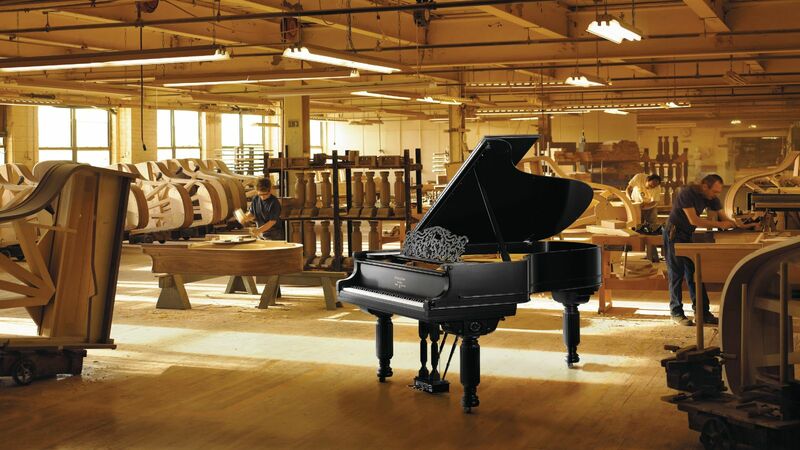 During the factory tour, you’ll witness the entire process of creating a STEINWAY. Starting with raw wood (maple, walnut, pear, spruce) and various veneers (mahogany, rosewood, ebony macassar), you will witness the entire process of the piano fabrication process. From the rim bending to action building, from polishing to the final tuning, by the end of your tour, you will understand what makes a STEINWAY piano so remarkable. – The factory is large and the tour covers a significant area. You must be able to stand and walk for 2 hours. Tours includes 3-4 flights of stairs. – There is neither seating nor rest areas available. – Open shoes, sandals, flip flops, etc. are not permitted on the tour. – Canes, walkers and wheelchairs are not permitted on the tour. – Tour participants will be exposed to dust and chemical odors. – Visitor parking is extremely limited near the factory. – Photography is not permitted. After the factory tour and a brief lunch, Kenneth McAleese and Karsten Peterson will give a presentation of the company, of its market position and of its strategy to face increasing competition from the Far East, and answer questions. Contact programming@hbscny.org to inquire about the waiting list.